After enjoying "The Incredible Banker" by Ravi Subramanian, I ordered few more books of his on flipkart. 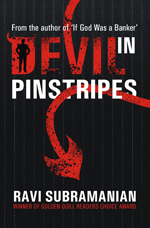 Started reading "Devil in Pinstripes" and finished it. Similar to "The Incredible Banker", "Devil in Pinstripes" is also about the life in Banking Industry, the frauds, internal politics, career growth etc. Makes an interesting reading. But because I'd finished reading "The Incredible Banker" just a week ago and both books have similar plot, I couldn't enjoy the second book as much as I had enjoyed the first. This is also probably because I was used to Author's way of story telling. Anyways, below is a quick review of the book. Plot revolves around Amit, who joins a MNC bank from IIM-B and his career progression, challenges, rivalry and conflicts in life. His boss, his peers and wife Chanda are key characters. First half of the book runs casually, without any anxiety (except for why Amit is in jail). The few challenges that come Amit's way appear normal ones. Second half has more exciting revelations on how fraud happens in loan disbursal and also collections. While the other book (incredible banker) was about credit card fraud, Devil in Pinstripes revolves around loans, credit and recovery. Narration style is exactly same as the other book- begins in present and takes reader back to 10-15 years to begin story telling. In this book author has given his own name to one of the characters towards the end (lawyer). Names of real world financial & non financial institutions are used liberally (including Anderson Consulting, which is now Accenture). Book hints how senior management think Also Chanda becomes Vice president by the end of story. Is it realistic for someone to become VP from fresher in Banking industry in a span of 15 years? The discounted price of 147 isn't heavy on pocket. Do read if banking world fascinates you. Pretty good review of the book. Seems we have quite a good number of Indian writers now that I am unaware of. Need to start reading again. 15 years is a lot of experience. Not sure of Indian banks, but VPs are quite common in American banks. SVPs and senior ranks are tougher. One suggestion, there seems to be some spelling mistakes in the post which could have been avoided by use of spell check. Spelling mistakes are a big turnoff to me, so thought of pointing it out. I hope you don't mind. I find load disbursal mentioned once. I guess that is loan disbursal.